These were a gift to Thomas from his Mother Matilda. Scope and content: Thomas Rypyngton and Johanne, his wife, daughter and heir of John Beylle. v. John Balle and Elizabeth, his wife, daughter and heir of John Wigane. : Detention of deeds relating to a barn and land in Lichfield. : Stafford. Pleading: Stephen J. claims that Thomas R. owes him £30 per a bond. Damages are claimed at 100s. Bond shown in court. Pleading: TR says that he is not able to deny that he owes SJ the aforesaid £30 or that the bond is of his making. Postea text: Therefore, the decision is that SJ is to recover the aforesaid debt plus damages assessed by the court, with SJ's assent, at 10s. TR is in mercy. From: Thomas Repyngton' of Lichfield To: Henry Willowghbe All Thomas's tenements in Lichfield, situated together in the street called 'Robestrete' alias 'Sadelerstrete' between the tenement of the gild of St Mary of Lichfield and the tenement of the chantry of Colwich ('Cantaria de Colwyche') in which John Goldesmyth' alias Boyer now lives and between the street and the bishop [of Coventry and Lichfield]'s fishpond. Also 3 acres of land lying together in a field called 'le Southeffeld' in the fee of Lichfield between the land late of John Ardren', knight, and the way called 'le Falsewey'. Also 3 acres of land lying together in 'le Deaneslade' between the field called 'le Twelfeacres' and the field of 'Berihull'' and the land of Roger Pierson. Also a moor lying next to 'Sandforde mille' between the common field called from of old ('ex antiquo') 'Medowdiche' and 'le milnebroke' and between the moor of Thomas de meysham and the path leading from Lichfield to 'Sandeford mille'. [All of?] which he recently had of the gift of Matilda Rapyngton' his mother. Given at Lichfield [Staffordshire]. Witnesses: John Stretehay; Richard Breton'; Robert Browne; Thomas Dodde Endorsed with description in 17th cent hand. From: Matilda Repyngton' of Coventry, widow To: John Palmer of Lichfield, gent John is to deliver seisin to her son Thomas Repyngton' of all lands and tenements in the town ('villa') and fields of Lichfield, in accordance with a charter made between her and Thomas. Given at Lichfield [Staffordshire]. Endorsed 'Rop' in 17h cent hand. 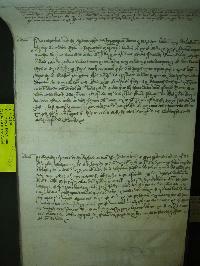 From: William Repyngton' of Lichfield, son and heir of Matilda Repyngton' of Coventry, widow To: Henry Willowgh'be, knight For all lands and tenements in the town ('villa') and fields of Lichfield which Henry recently had of the gift and feoffment of Thomas Repyngton', William's brother, and which ought to descend to William after the death of Matilda, his mother. Given at Lichfield [Staffordshire]. Witnesses: Richard Breton'; Robert Browne; Thomas Dodde Endorsed with description in 17th cent hand. From: Matilda Repington' of Coventry, widow To: Thomas Repyngton', of Lichfield, son of Matilda Repington' of Lichfield, widow All her tenements in Lichfield, situated together in the street called 'Robestrete' alias 'Sadelerstrete' between the tenement of the gild of St Mary of Lichfield and the tenement of the chantry of Colwich ('Cantaria de Colwyche') in which John Goldesmyth' alias Boyer now lives and between the street and the bishop [of Coventry and Lichfield]'s fishpond. Also 3 acres of land lying together in a field called 'le Southeffeld' in the fee of Lichfield between the land late of John Ardren', knight ('miles') and the way called 'le Falsewey'. Given at Lichfield [Staffordshire]. Witnesses: John Palmer; John Stretehay; Robert Browne; William Rukkeley; Richard Breton; John Hille Endorsed 'Repington' in 15th cent hand. From: Henry Willowghbi, knight To: William Myddelton, succentor of Lichfield Cathedral; John Paxon of Lichfield Cathedral ('de eadem'); William Webe of Lichfield Cathedral ('de eadem'); Thomas Pole of Lichfield Cathedral ('de eadem'); John Baker of Lichfield Cathedral ('de eadem'); Richard Worcetter of Lichfield Cathedral ('de eadem'); John Berehull' of Lichfield Cathedral ('de eadem'); Humphrey Cotton of Lichfield Cathedral ('de eadem'); William Wright of Lichfield Cathedral ('de eadem'); Thomas Diar of Lichfield Cathedral ('de eadem') All his tenements in Lichfield situated together in a street called 'robestrete' alias 'sadlerstrete' between the tenement of the gild of St Mary of Lichfield and the tenement of the chantry of Colwich ('cantaria de colwiche') and between the street and the bishop [of Coventry and Lichfield]'s fishpond. Also 3 acres of land lying together in a field called 'le sowthefelde' in the fee of Lichfield between the land late of John ardren, knight ('miles') and the way called 'le falsewey'. Also 3 acres of land lying together in 'le deaneslade' between the field called 'le twelfeacres' and the field of 'berehill' on one side and the land of Roger Pereson on the other. And a moor lying next to 'sandeforde mille' between the common field called from of old ('ex antiquo') 'medowdiche' and 'le milnebroke' and between the moor of Thomas de meisham and the path leading from Lichfield to 'sandforde mille'. [All of] which he had of the gift of Thomas repyngton of Lichfield. Henry has appointed John stretehay of Lichfield, gent, and John dyson of the same, burgess, his attornies to deliever seisin of these lands to William, John, William, Thomas, John, Richard, John, Humphrey, William and Thomas. Henry's signature on plica. Given at Lichfield [Staffordshire]. Witnesses: William Overton; Thomas Dodde; John Kyrke; John Myddelton; William Birmyngcham; John Wigan Endorsed with description, stating that part of the property was annexed to the vicars choral for the obit of 'Dominus' John paxson, sacrist, in early 16th cent hands. 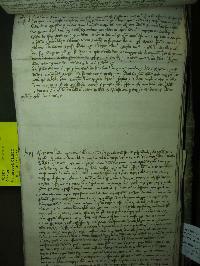 'Staffordshire Fines: 21-38 Henry VIII', Staffordshire Historical Collections, vol. 11 (1890), pp. 269-292"
Thomas and Joan, and John remitted all right to Anthony and Matilda and heirs of Anthony, for which he and Matilda gave them £16 sterling. testifying that William Bargyn was born in a house in Saddeler Stret in Lichfeld. Parchment. Holborn, bought by Sir Henry Willoughby (1451-1528), and passed in around 1570 to George Fox alias Willoughby, illegitimate brother of Sir Francis Willoughby. and appoints Sir William Benett, chaplain, and Thomas Foxton, of Haverbargh, his attorneys to deliver seisin of the same. Witnesses : Henry Manne, John Hardy, John Barford, Thomas Repyngton, of Haverbargh, Roger Crafte, Richard Carter, Nicholas Jakes, Richard Harper, and John Cristyan, of Boudon, and many others. by the gift, grant and confirmation of John Janen, to hold, etc., eta, and appoint William Wyllyngore their attorney to deliver seisin of the same. Gift by Thomas Repynton, fishmonger, and Joan his wife, one of the heiresses of John Bayly, smith, to John Colemore, subchanter, and to the vicars, of 18d in rents from a croft without the Bars, in Sondford Street. A vicar choral is a professional adult singer in a Cathedral choir, presumably sub-chanter sings the lower bass line. They are not in holy orders; the term "vicar" in this context simply means a deputy. Sonford Street is now Sandford Street, Lichfield - a continuation of 'Robestrette'; owned by his parents William and Matilda.